Photo: www.turismoayacara.cl - Laguna San Rafael, Chilean Patagonia. One of the driest places on Earth, although there are parts where every few years takes place the strange but beautiful phenomenon known as "The Flowering Desert". In parts the landscape is unreal, to the point that NASA has used in a practical way the similarity of this area with the surface of Mars. In addition to the geysers, salt flats, volcanoes and lakes of the Andean plateau, Atacama is also archaeologically one of the richest places in South America. Equally, the Astronomical Tours are a good choice, as the clear skies of the Chilean desert make it a perfect location to scan the Universe. 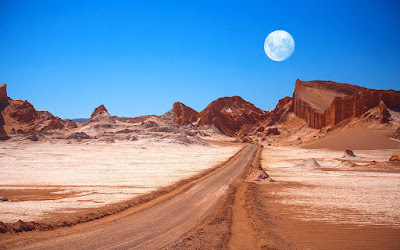 In fact, Atacama is considered the best place on Earth to observe the firmament and to the date there are about fifty operators who offer tours related to the topic. Chiloe Archipelago is a group of islands full of traditions and mysteries. One of its charms are the typical "palafitos". These stilt houses are constructions on wooden pillars in the water which are not native to Chiloé architecture, but were adopted in some coastal towns of the Archipelago for a better use of the coastline during the trade expansion in the nineteenth century and continued to be built until the middle of the last century. Today, along with the Churches of Chiloe, the "palafitos" are among the most representative postcards of the main and adjacent islands. One of the emblematic tourist places throughout the World. Located at the southern tip of South America, it is shared between Chile and Argentina. 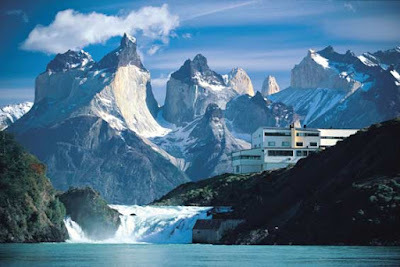 The Chilean side is smaller and less promoted than the Argentine Patagonia, however has a great diversity of spectacular landscapes, not only Torres del Paine National Park, recently recognized as the Eighth Wonder of the World by VirtualTourist.com. For its geographical location and the presence of the Andes Mountains along most of its length, Chile is a privileged country in terms of ski hills (among other things). Depending on the meteorological trend of every year, the season can last from June to September, even some resorts are equipped with snowmaking machines. There is a long list of places to ski in Chile. The best known and best equipped in Central Chile are Portillo, La Parva, El Colorado, Farellones, and Valle Nevado. In the South stand out Nevados de Chillan and the newly created Corralco Mountain and Ski Resort. Valparaiso, 119 km. of the capital Santiago, is the main military and commercial seaport of Chile and the second largest city in the country. One of the features that most attracts the attention of visitors are the colorful houses that sometimes seem to be hanging of its intricate geography, full of hills, each with a different name. Striking are also its funiculars, historical means of transportation used by the inhabitants of the hills, given that the first dates from 1883, born on the initiative of European immigrants. Next to Valparaiso you can visit the beautiful city of Vina del Mar, the main tourist center of Central Chile. I would rather say: according to its length Chile is the narrowest country in the World, with a maximum width of 445 km. and an average of 177 km. But opossite to this condition it is also one of the longest countries on Earth because without considering its Antarctic territory on which claims sovereignty, Chile has a length of 4270 km. If you visit Torres del Paine, National Park of exceptiomal scenic beauty in Patagonia, you can see a Puma. The population of this protected species in the natural area is app. of 50 specimens, but if you are lucky, you will be able to see them in their natural habitat. The Pumas of this part of the World are among the largest of its kind. 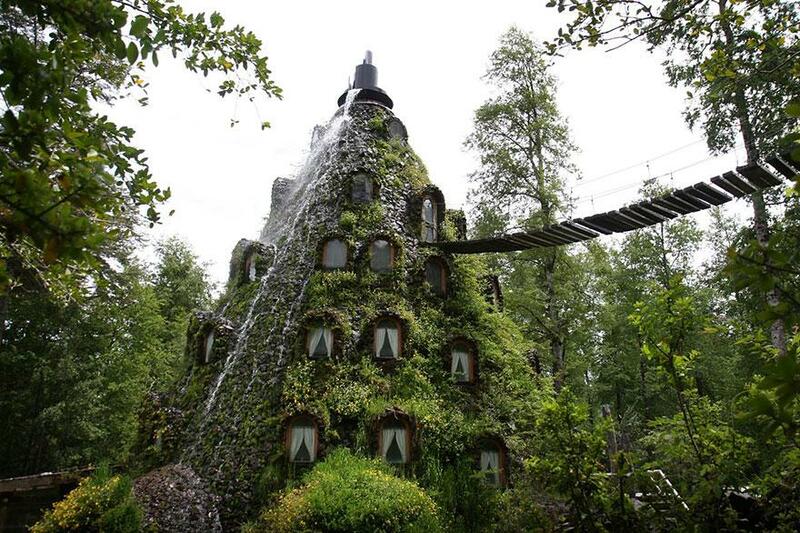 This mountain-shaped hotel is covered with vegetation, everything is made of wood and has a permanent waterfall on the outside. Better connection with nature is difficult to find elsewhere. 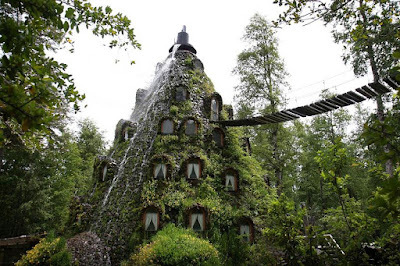 "La Montaña Magica" is one of several eco- friendly hotels located in Huilo Huilo Biological Reserve, one of the best natural destinations in southern Chile, year after year visited by thousands of people who are looking for to escape the city and get connected with nature. Cabo de Hornos (Cape Horn) is the name that receives the most southerly headland of the island of Hornos, belonging to the archipelago of Tierra del Fuego, traditionally considered the southernmost point of the Americas. The skies in the Atacama Desert are privileged because of its zero pollution and cloud-free conditions almost all year round, which makes them the cleanest in the world. For this reason, the Chilean desert concentrates 40% of the largest telescopes on the planet and today, Astronomical Tours are one of the many tourist activities carried out in the North of Chile. 11.- Rafting in "Cajon del Maipo"
Known as one of the best rivers in Chile for rafting and located just an hour East of Santiago, going down the Maipo River is one of the most incredible and entertaining experiences you can do in central Chile. In Rio Maipo, with sections of rapids II, III and IV there are several companies that offer their services to enjoy this sensation in a truly unforgettable panorama at the foothills of The Andes. Together with Patagonia and the Atacama Desert, Easter Island forms the tourist trilogy of Chile. Although geographically it belongs to the Polynesia, administratively depends on the Chilean Region of Valparaiso, under the regime of "Special Territory". For its remote location, traveling to Rapa Nui, one of the most mysterious places on the planet, is like a dream that perhaps can be performed once in a lifetime. Unlike most ice masses all over the world, Pio XI Glacier, also known as Brüggen Glacier, has undergone significant progress in recent decades. Its approximate surface is of 1300 km2., with a length of 64 kilometers, front of 6 kilometers and ice towers surpassing 75 meters of height. Pio XI is one of 48 glaciers that come from the Southern Ice Field, a great glacial mass of 350 km. long located in the Patagonian Andes, of which about an 85% belongs to Chile and the rest to Argentina. Humberstone is an old mining town in the Atacama Desert, named after James Humberstone, a British chemical engineer who emigrated to South America in 1875 and made a fortune with saltpeter. Nowadays, far from its flourishing past lived between the end of the 1800s and the early decades of the 1900s, the town that housed more than 3,700 people is just a legend, considered one of the ten most ghostly places on the planet, what has encouraged tourist agencies to perform different tours through its dusty streets and corners. Humberstone and the neighboring Santa Laura Salpeter Work are a National Monument of Chile and were declared a UNESCO World Heritage Site in 2005. In the commune of Algarrobo, within the "San Alfonso del Mar" Hotel Complex on the shores of the Pacific Ocean, you can visit the World's largest swimming pool, recognized by the Guinness Book of Records. To give us an idea, this is an artificial lagoon of more than one kilometer in length, covering an area of about 8 hectares and of more than 250,000 cubic meters of seawater. All equivalent to about 6,000 "normal" swimming pools. In Winter, its snowy slopes are an invitation to visit the Ski Center, but guided trekking around Villarrica Volcano is carried out all year round, starting from the tourist agencies of Villarrica and Pucon. This trekking is one of the main adventure activities for tourist since it is said that Villarrica is the most spectacular volcano of Northern Patagonia besides being one of the most active in South America and the World. At the summit of 2847 mts. you can enjoy a panoramic view of the lakes and other mountains of the region. The Carretera Austral is one of the most spectacular roads in South America, the ideal setting for adventure tourism as it is a journey through the most attractive landscapes of Patagonia. Although the route is quite demanding in effort (mostly of gravel), more and more people choose the option to tour it by bicycle. Pichilemu had until now been a little-known town, nevertheless it is becoming one of the best tourist places of the Central Chile. It has many attractions but by far the most outstanding are its beaches, which today are already known worldwide for being among the best for surfing. It is located on the coast of O'Higgins, Sixth Region of Chile, 227 km. SW of Santiago. For those who want to surf, the best place in Pichilemu is Punta de Lobos, 6 km. to the South where the crests of up to 8 meters have turned this place into a dream beach for all lovers of waves and adrenaline. Pablo Neruda, one of the two Chilean Nobel Prizes for Literature, had 3 residences, named by himself as "La Chascona" in Santiago, "La Sebastiana" in Valparaiso and the third one, which today is its own mausoleum in the village of Isla Negra. The Bard's houses are now Museums open to the public and can be visited without prior booking. Each residence is like a Neruda's poem but without words, full of stories, souvenirs, documents, secrets and magic, that will surprise and amaze the visitors. 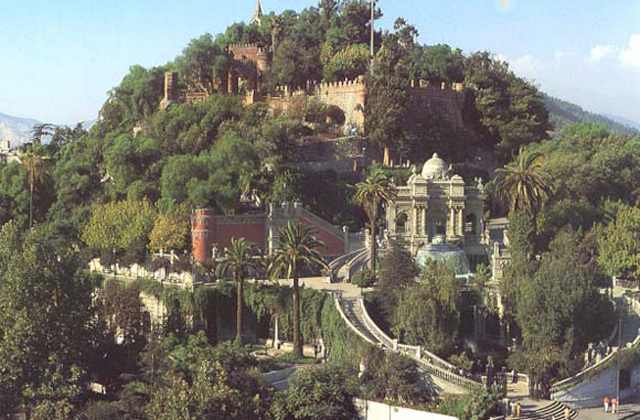 Cerro Santa Lucía is one of the most accessible tourist attractions in Santiago since it is located in the heart of the Chilean capital. It is a small hill (69 mts.) that was remodeled in 1872 but today, it has become an important tourist center because of its fountains, gardens, terraces and balconies, it is also a historical place, in its hillsides the conquistador Pedro de Valdivia established his camp before founding Santiago in 1541. Until a few decades ago, the gastronomy in Chile was rather modest in variety, especially in restaurants. Along with the country's economic growth, the number of good restaurants has grown significantly and the quality and variety of food has evolved to unexpected levels. The Barrio Bellavista (Bellavista Neighborhood), one of the bohemian centers of Santiago, also stands out for presenting one of the best gastronomic offerings in the capital of Chile. In this neighborhood, as well as in Santiago in general, there is certainly a large number of restaurants that could be named, but The Telegraph makes special mention of "Peumayen Ancestral Food", specialized in a menu that combines products and original techniques of the main cultures of pre-Hispanic Chile.